Work with—not against—the jeans' voluminous shape. A puffy-sleeve blouse elevates the denim. 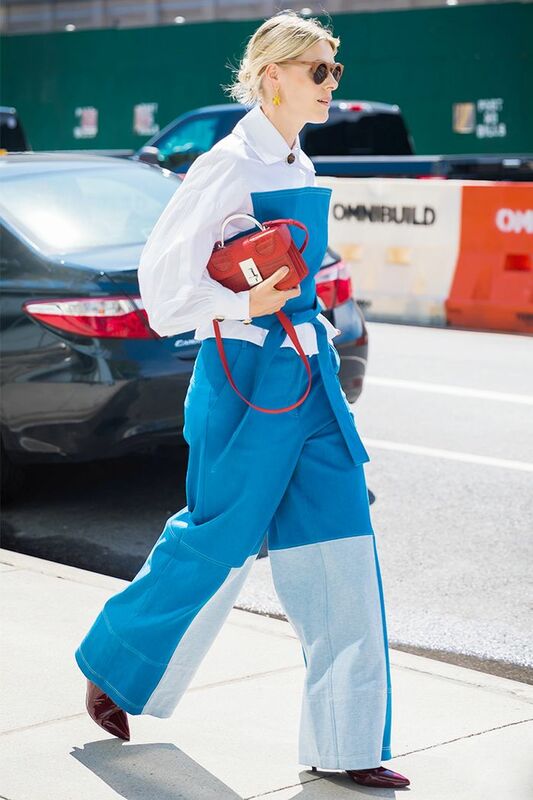 Yes, patchwork denim can be work-appropriate sometimes. Pair with a statement top and cool earrings. A high-waisted pair is begging to be worn with a printed top. Just add a statement bag. Try this simple yet polished combo this winter: button-down + turtleneck + wool coat + heeled boots. Cuff your pair to show off cool ankle boots. Wide jeans are sleek and sophisticated with a turtleneck and suede boots. A cropped cut makes these jeans a bit more casual. Let pointed-toe pumps peek out underneath a long hemline. A structured top balances the wide jeans. Make the denim work for an evening event with a printed bodysuit and sandal heels. Wear an oversize button-down shirt untucked over the jeans for a cool, relaxed look. Tuck in a slouchy sweater and add in fun accessories. Match the wide silhouette with a chunky knit sweater. Pairs so well with a crisp poplin shirt. Elevate your simple jeans-and-a-tee combo with the denim. A statement top and slides make wide-leg jeans look instantly cool. Wear your wide jeans with a cool trench and turtleneck sweater. Try a cool zip-front pair, like this one from Off-White. Freshen up your pair with white loafers. Play with proportions by doubling up on the voluminous shapes. We love a good Canadian tux. And now, shop the best new jeans.